Well, I must confess, I was pretty late to the massive Twilight party. I'm not sure if this is because I'm male and the franchise isn't as big with men as it is with women, or I was simply not paying attention to the awesomeness. I was aware of Twilight when the films came around in around 2008. With a lot of people, Twilight provokes quite a strong disliking and so all I heard was that the premise was "rubbish" and that I shouldn't go anywhere near it (enforced by the likes of Reddit and so on). But, my girlfriend at the time said we should watch it, so I agreed. And this may cost me manliness points, but I loved the first film, and kept on watching them all until Breaking Dawn Part 1 came out. However, when BDP1 when came out, I wasn't that impressed, and I finally thought to myself "hey, read the books, maybe the film adaptation on this one got it wrong". And so I bought all of the books on my kindle, and finish all four within a month (which is pretty darn quick considering I'm a very slow reader). As for my favourite book. I would have to say that my favourite book is New Moon. Why is that? Well, I love the wolf pack as said before. And I loved Edward being able to hear about the dynamic of the pack and I thought it was truly amazing. I also really loved the Quileute legends which were so fascinating to me and I marvelled at the story telling of Meyer. And of course, the conclusion of "the triangle", which had been going on for the most part of three books. Oooooo, this is a tricky one. I'm personally going to have to go with Jacob. Maybe a popular or unpopular choice, but I really loved his character. I really like that Jacob wears his heart on his sleeve. 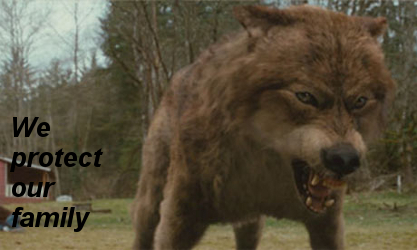 Isn't afraid to show Bella how much he cares for her and of course, he's a frigging Wolf. That's pretty cool. I also liked him because in the books, he's the same height as me. Bit of a silly reason, but it's nice to have a really tall character, not often does this happen in books. I also like that fact that he's a real young lad and acts that way. He's very emotional and hot headed at times, and I thought it was nice to see that in contract to Edwards very serious/examine everything before you do it, type demeanour. I thought it made for a good contrast and made their relationship very interesting. Another difficult one. I'm going to have to go with Charlie on this one. I know, not what most people would have picked. But in this extraordinary world with Vampires and Wolves, Charlie for me really brought home the much needed grounding in the story that both Bella as a character, and I as a reader needed. It gave something to keep Bella connected to her "impossible world". I also just really liked Charlie as a character. I think Charlie was supposed to highlight the best characteristics in the "average Joe" male, and I loved that about his character. He was perfect, but he loved his daughter and tried to help people. Always really liked that about Charlie. Ah, we're back to me . Erm, my interests are really reading, watching films, computing (tis my job) and Brazilian Jiu Jitsu. I'm actually from London, and no,I don't know the Queen unfortunately. But I would very much like to move to Canada when I'm done doing my degree in computing. I absolutely love the people and the scenery other there. If I never manage to emigrate, I shall be very disappointed with myself. I am the ripe old age of 20. I'd like to give a big thanks to Kevin who set my account up for me. Especially because there was a problem with my account and couldn't log in, so I had to keep emailing him. So thanks Kevin! Just a big thanks to everyone on here. Hopefully things are still active here even though I'm so late to the game. And would love to have a chat with anyone. Hi there! It's quite here these days, and it had been so long since there had been new members I'd stopped checking in here. There's still a lot around here to look at and still some communities operating. Look around and you'll find some friends!